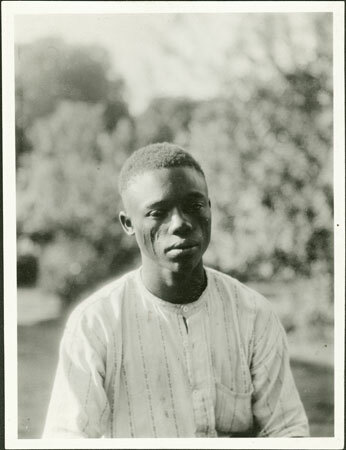 An upper body full face portrait of Kamanga, Evans-Pritchard's personal servant during his fieldwork in Zandeland, with cictrisation on the cheek. Kamanga was raised in and around a Prince's court, and as one of Evans-Pritchard's chief informants became a novice binza or witchdoctor, imparting much ethnographic information concerning the corporation and its knowledge of medicines. Notes on print/mount - "52/4 +11 EPA 503"
Notes on card mount m/s pencil - "mark - middle SSS-RHS + LHS"
Morton, Chris. "Evans-Pritchard's Zande servant Kamanga" Southern Sudan Project (in development). 03 Jan. 2006. Pitt Rivers Museum. <http://southernsudan.prm.ox.ac.uk/details/1998.341.503.2/>.